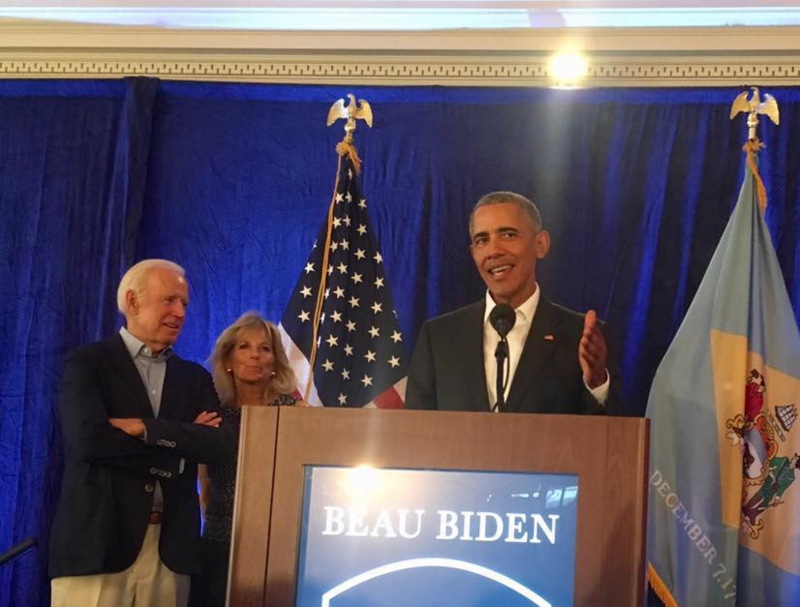 A surprise guest came out to a fundraiser for the Beau Biden Foundation being held at the Wilmington Country Club last night: the greatest living former President alive, Barack Obama. The annual Beau Biden Foundation Cocktail Reception and Silent Auction is a big fundraising for the Foundation, which works to expand and continue work training adults in child abuse prevention and kids and families in bully prevention. Here is some video of his and the greatest living former Vice President, Joe Biden’s, remarks. “It’s big club….and you ain’t in it. I want you to know, I ALMOST nailed exactly what you said before I looked at your comment. I didnt get the Carlin reference, so I guess you’re only 90% predictable. I expected “Obomba” or something like that, but maybe it’s still early. I’ve noticed that your sole argument against any of my comments is they offend your sensibilities. Now that’s 100% predictable. I mean, yeah. it isnt like you offer anything of substance to argue about. @DD: Yeah, much smarter to raise money for charity by asking for donations from the poor. Also, where did you get the idea that this was about Democratic voters rather than its actual purpose? More signs of botdom. I’m sorry, I meant to address that to DC, not DD. There wouldn’t be so much need for charity if, while in office, they had actually done something for their vote constituents instead of their cash constituents. More bot-like behavior. Do you know what the charity does? Um…. what is so “great” about these guys ? In Delaware Dems own mind! Look again at where the bar has been set. Seems like you as critics are more knee-jerk than the people you’re criticizing. All – and I mean all – they do is criticize. They never – and I mean never – offer solutions or demonstrate understanding of any subject. That’s why I suspect pay for play. Do you really think you offered anything of substance in the health care discussion? I don’t. Not one solution or idea. No one bit of understanding how health care/insurance works. Pandy, If I or you had a solution. That would work for everyone, then we would be hero’s. But, you or I are not going to make everyone happy. Yes, IMHO, everyone should have access to affordable healthcare. But, there are a great number of factors. Do I believe that single payer is the answer, no. But, we have some smart people in this country and there is a solution. But, we have elected officials, both D’s & R’s, that want something for themselves and not for who they represent. @Anono: Perhaps you failed to notice, but this post was about raising money for a charity that has nothing to do with politics except Biden’s involvement. Yet some asscrack decided it was a good place for a cheap shot.